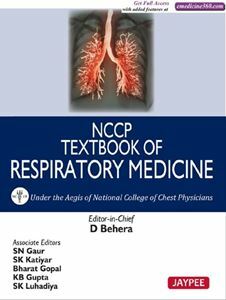 This is a multi-authored textbook on Respiratory Medicine that gives an updated version of various pulmonary diseases. This book highlights the problems of tuberculosis and lung cancer, its pathogenesis and newer diagnostic modalities and the Revised National TB Control Programme. Discussions on acute respiratory failure and ARDS have been given by experts. This is an excellent referral book for the postgraduate, postdoctoral and undergraduate students. This also serves as a handy reference book for busy practitioners for the management of common respiratory problems.